Part of my journey as a jewelry designer and maker has included creating pieces that walk the very thin line of fashion, wearable objects and art. Some of them challenge the body by its size or question the user through material choice or shapes. Part of my graduate studies thesis. Leather, copper, brass, copper foil, 22k gold foil, wood. Jewelry Collection of one-of-a-kind pieces. Polymer clay, brass, copper, sterling silver, 14k gold-filled brass, leather, acrylic, wood, semi-precious stones. Sterling silver, brass, wood, copper, rubber. Set of four rings representing the four seasons of the year. Copper, color pencils, gesso, varnish, canvas, acrylic. In Unknown Memories I used chasing and repoussé to create three copper brooches inspired by the brocade print of a particular yardage of fabric that traveled from Peru many years ago with my grandmother when she visited my mother in Mexico, before I was born. I have known this fabric from photographs and hand-painted the motifs on 3 canvases where the brooches sit when not in use. The designs of the brooches were taken directly from the brocade and I designed them to camouflage against the painted canvases. I also designed them to look like drawer pulls and all three have handles. I chose to make them look like pulls, as one often stores memories and loved mementos inside drawers. I named the triad Unknown Memories, as I never actually met my grandmother. Faux Luxury is a commentary on consumerism and our perception of wealth, value, and luxury. What are we buying? Is buying a broken piece of jewelry 70% OFF really a great deal because it is "designer jewelry"? 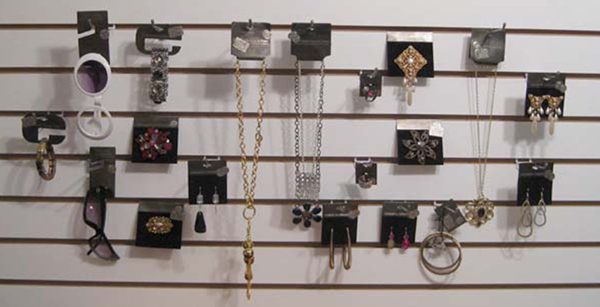 The installation includes 19 etched brooches that resemble real jewelry on jewelry cards hanging at a store. Alpaca, merino wool, embroidery floss, acrylic, woven brass. Real Gold questions the value we have attributed to certain materials through time. It's quite known that civilizations like the Inca's placed great value on their woven and knitted work rather than the gold that was abundant in their region. This neck piece is made of felted "doblones" (doubloons) with embroidered markings from coins from the times of the Spanish Conquistadors.